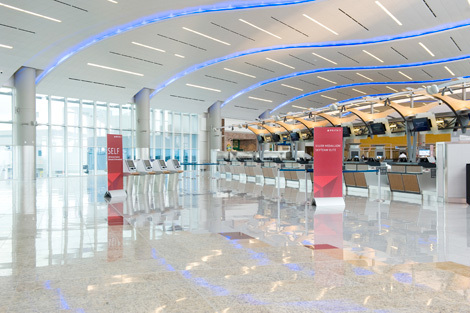 Delta Airlines is set to operate the first official flight from the new concourse F at Atlanta’s Maynard H. Jackson Jr. International Terminal, when flight 295 departs for Tokyo Narita tomorrow (May 16). The carrier will then welcome the terminal’s first arrival, with flight 177 from Dublin touching down soon after. The new terminal concourse F joins the existing concourse E and adds 12 gates capable of handling wide-body jets. The new facility eliminates the need for Atlanta-bound passengers to recheck their baggage and clear security at concourse E.
Departing customers will access the international terminal via Interstate-75 at exit 239, with a shuttle service connecting passengers to the domestic terminal, parking facilities and MARTA train services to downtown Atlanta. 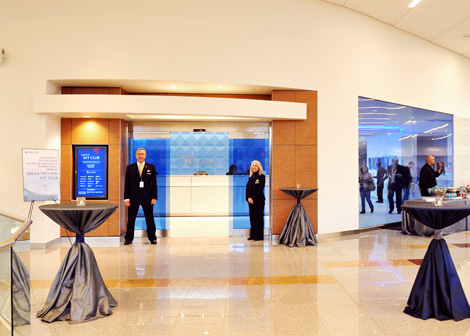 Inside concourse F Delta customers can take advantage of the newest Delta Sky Club facility, featuring seating for over 300 guests, eight shower suites, multiple work areas and a bar with premium wines, champagnes and spirits available for purchase. Richard Anderson, Delta’s chief executive officer, said: “Delta’s contribution to the new terminal and concourse is part of a more than $3 billion investment in facilities, products and technology in the air and on the ground. Work is underway on a $160 million renovation at New York’s La Guardia Airport to support 100 new daily departures, including a new Delta Sky Club. A $1.2 billion expansion of Terminal 4 at New York-JFK will house nine new international wide-body gates and a flagship Delta Sky Club when it opens in spring 2013. Delta’s facilities at Los Angeles International Airport are being renewed as part of the airport’s wider $4 billion overhaul, including a new baggage system, better customs processing facilities and improved food and beverage options. Atlanta Hartsfield-Jackson is Delta’s hub airport, with the carrier operating more than 1,000 daily departures. The carrier recently dropped its London Gatwick to Atlanta route in favour of a second daily flight from London Heathrow (see online news February 23). For more information visit delta.com, atlanta-airport.com/internationalterminal.